In 2012, OSHA set requirements for safety standards that applied to companies working with many dangerous chemicals. Since then, companies have had to keep safety data sheets (SDSs) on site. In the past, the requirement stated that they had to have material safety data sheets (MSDSs). While the change has provided many benefits, it can also be confusing to many people who aren't familiar with what the differences are and why the change occurred. Image Credit: Jeffery Vinocur - An example SDS in a US format provides guidance for handling a hazardous substance and information on its composition and properties. When Did MSDS and SDS Start? Material safety data sheets started as part of an effort to ensure employees knew about the risks they were exposed to in the workplace. The 'Right to Know' concept was very important for OSHA back in the 1990s because so many workers were exposed to risks that they weren't aware of. Even though the first material safety data sheets didn't necessarily reduce the risk of chemicals directly, they did help keep people informed. Armed with this knowledge, employees could take additional steps to improve safety in a more concrete way. Plus, learning of the risks involved with working with a dangerous chemical often makes people work more carefully. In 1994, the first requirements to provide information about chemical hazards to employees were released. The requirements weren't very detailed, though, which made it almost more confusing than helpful for everyone involved. One of the main requirements, however, was the material safety data sheet. Facilities had to have these sheets for each dangerous chemical present in the workplace. Material safety data sheets (MSDS) were one of the original requirements of OSHA's Right to Know rules. Companies were told they needed to have information about every chemical in a facility so that the employees could review it. The guidelines for these sheets were extremely basic, which gave employers a lot of wiggle room about what to include and how to format that information. When OSHA or anyone else reviewed MSDS in multiple facilities for the same chemical, they found that they looked entirely different. This was clearly a problem since companies were not following any single standard, which made communicating about hazardous chemicals challenging. OSHA decided to make an update to their Right to Know rules, also know as the Hazard Communication Standard (HCS or HazCom), in 2012. This update was based on the United Nations' Globally Harmonized System (GHS), which standardized chemical classification and labeling, and it is where safety data sheets were first really standardized across facilities. The main purpose of formalizing the safety data sheets was to make sure that employees in all facilities would see a single format with standard information for the hazardous chemicals they work with. Standardizing this information makes it easier for people to understand, and therefore more effective at keeping people safe. Safety data sheets are used to provide information in a clear and helpful way to employees, safety personnel, and others who work in the facility. The SDSs contain a variety of important information that people can use to increase safety. For example, the information on a safety data sheet is used to identify what needs to be on a label for a specific chemical. For facilities that use industrial label printers to create their own labels, this is essential information that will help them stay in compliance with OSHA. What Information Is on a Safety Data Sheet? Safety data sheets contain different information in different countries, though the information included is typically quite similar. In the United States, OSHA sets requirements for what information is on the data sheets and when data sheets are needed. These sheets should have descriptions of all of the physical and chemical properties of the chemical. To put it simply, they should contain all useful information about a particular chemical. In many cases they will have information about toxicity, flash points, health hazards, guidelines for dealing with spills or leaks, requirements for storage, requirements for disposal, and much more. Identification - Identifies the chemical that the SDS is for, which includes such information as the chemical name, manufacturer, distributer, recommended uses, restrictions for use, and more. This section should also include the phone number, emergency phone number, and address of the manufacturer or distributer. Hazard Identification - This is a list of all the hazards associated with the chemical. In this section is a list of any hazard label requirements. Composition - Here is a list of the ingredients of the chemical. Any trade secret claims also should be listed in this section. First Aid Measures - Detailed information about any first aid that should be given, and when. For example, instructions for what to do if the skin is exposed to the chemical. Also in this section are symptoms or effects (including acute, delayed, etc.) from exposure to the chemical. Fire-Fighting Measures - Information about the impact to the chemical if it catches on fire, how to extinguish a fire, and more. Accidental Release Measures - Instructions for what to do should there be an accidental release of the chemical. How to contain it, how to clean it up, what protective equipment is needed, etc. Handling/Storage - List of instructions for safe handling and storage of the chemical. Any precautions that must be taken are listed here too. Exposure Control - Here is information from OSHA's permissible exposure limits. Any threshold limit values, engineering controls, and what type of personal protective equipment should be used when working with the chemical. Physical/Chemical Properties - Detailed information about the characteristics of the chemical. Stability and Reactivity Information - A list of all chemical stability information as well as any possible hazardous reactions that could occur. Toxicological Information - Notes for how someone could be exposed to this chemical, symptoms of exposure, etc. Ecological Information - Information about what impact this chemical can have on the environment, especially if it gets into a water supply. Disposal Information - Proper instructions for how to safely dispose of the chemical, including any special restrictions or requirements. Transport Considerations - Instructions for how to safely transport the chemical. Regulatory Information - All information related to the regulatory requirements of the chemical. Other Information - This section is for other information that may be needed that doesn't fit into the other sections. Things like the date when the chemical arrived or the date when it was prepared would go in this section. It is clear that the new SDSs are very structured, which makes them much more useful for people reading them. The 16 sections also must appear in the order listed above. This is important because it allows readers to quickly find the information they need. To put it simply, MSDSs were a mostly informal requirement that could be confusing for people using them because they weren't standardized. While they were a step in the right direction, they did not always have the desired effect. SDSs, on the other hand, have brought about a standardized approach to this type of document that puts everyone on the same page. It is important to note here that while there were many problems with the MSDSs, it was an improvement over how things were done before. Most experts believe that facilities genuinely attempted to provide good information, but since there was no standard, it was difficult. These MSDSs were also written by people who were not true experts about the chemicals in question, which made them less effective. Updating to the SDS allowed employers to ensure they had everything they needed on the sheets, and made it a lot easier for employees to understand the often-complex information. Manufacturer's name and information, hazardous ingredients, physical and chemical characteristics, fire and explosion data, reactivity data, health hazard data, precautions for safe handling, and control measures. While this did have some very good information, it was incomplete compared to the 16 sections that are in place today. If a facility is still using the MSDS, it is important to upgrade to the SDS right away. Many facilities feel overwhelmed because it seems like a big job, but in reality it is quite simple to complete the upgrade. Facilities that buy chemicals from an outside organization actually have almost no work to do. They just need to request that chemical manufacturers provide SDSs. Manufacturers are responsible for providing these sheets (and updating them as any changes come out). The majority of chemical producers today actually have SDSs available for download right on their website, which can be printed off. If a business can't get an SDS from the manufacturer for some reason, the facility is responsible for making one in-house. While this will certainly be more difficult than requesting one, it really isn't too difficult. Start by going through each of the 16 required categories (listed above) and gathering as much information as possible. 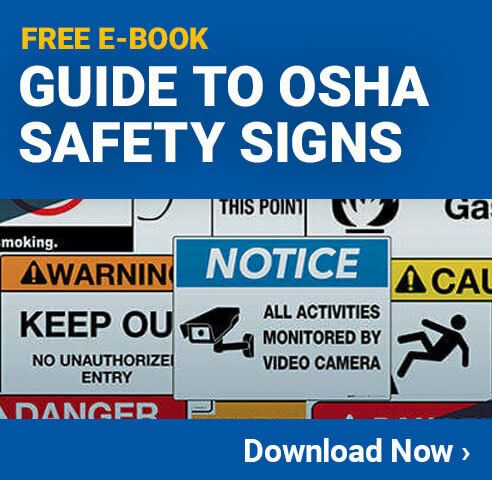 OSHA also has a quick guide for helping facilities create their own SDS, which can be found HERE. Filling out each section in order will yield a very basic safety data sheet. Using some simple formatting techniques, it is easy to get everything into an easy-to-read layout. When done, companies will have their own custom safety data sheets. While this does take some time to do for each chemical, most facilities don't need to do this very often because the sheets are readily available from the chemical manufacturers. For an in-depth overview of how to move from MSDS to SDS, watch this video. While the camera work leaves much to be desired, the information in the video is quite helpful. The SDS standard has been in place for several years now, and it is important to make sure all facilities are using the new standard. While there are clear differences between MSDS and SDS, people often use the terms interchangeably. While not technically correct, it is good to be aware of this practice. No matter what people call these standards, it is very important that all facilities have up-to-date safety data sheets on site for every chemical that they use. Facilities that are audited by OSHA and found to be missing safety data sheets can be cited with a violation, which is very serious. In addition to the risk of a fine from OSHA, safety data sheets are one of the most important safety documents a facility can have. Having them on site and available for people to review can dramatically reduce the risk of an accident related to chemicals, and can minimize the impact should an event occur. For how easy it is to have SDSs on site, there is really no excuse to not have them available to everyone in a facility for every chemical that is used. This includes any chemicals that are only occasionally used in the facility.